My Dad flew in from Florida and crewed for me at the LT100. We made fantastic preparations but in the end, he only had to crew through mile 39 (Twin Lakes) before I became ill from Altitude Sickness. 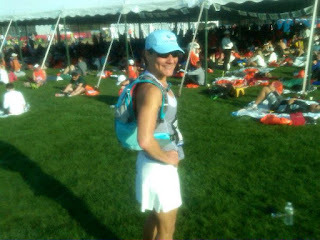 It was an amazing 34.5 miles.....and my first DNF. If you want the much longer version, see the post HERE. 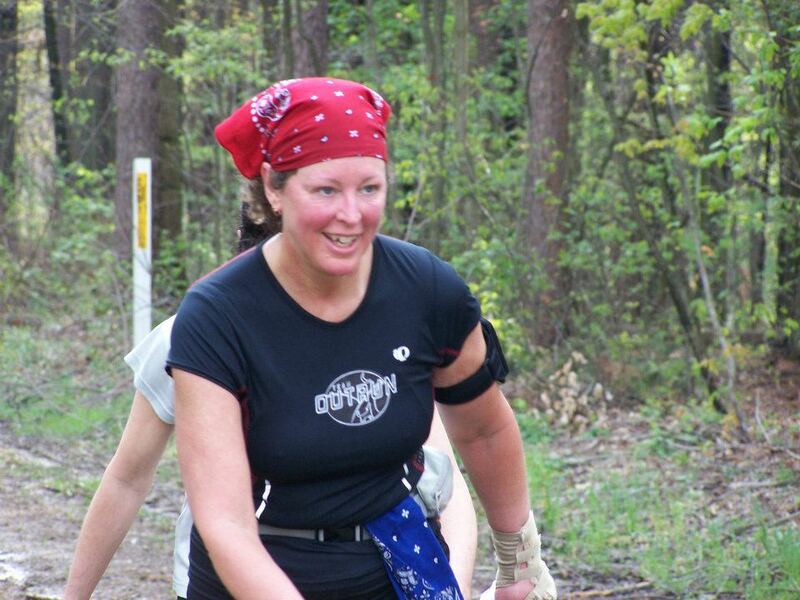 First annual Outrun 24 Hour Endurance Trail run. I’ve been running Ultramarathons for several years now, but have kept them all to 50Ks. I have 8 ultras and 8 marathons (including Boston) under my belt so due to peer pressure from others in the Outrun group, I decided to step it up a notch and signed up for my first 100 – Burning River in July. I’ve been training all winter with long runs, hill repeats and speed work outs. My main running partner for the long runs has been Michele Fortuna, and we have been knocking out back to back long runs for a several months. 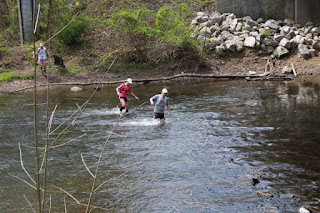 We ran a 30 mile ‘taper’ run the weekend before Forget the PR 50K. Zack Johnson and Radames Colon have pushed me thru some speed workouts at Holden, PenGlen and North Chagrin. When Zack announced the first annual O24 race, I knew that would be the perfect place to test my endurance and nutrition. A couple of things I have learned over the last few years – doesn’t matter how much training you do if you don’t stay hydrated and keep your nutrition up, you will bonk. You may finish, but not where you want. So the week before the race I started getting my nutrition planned. 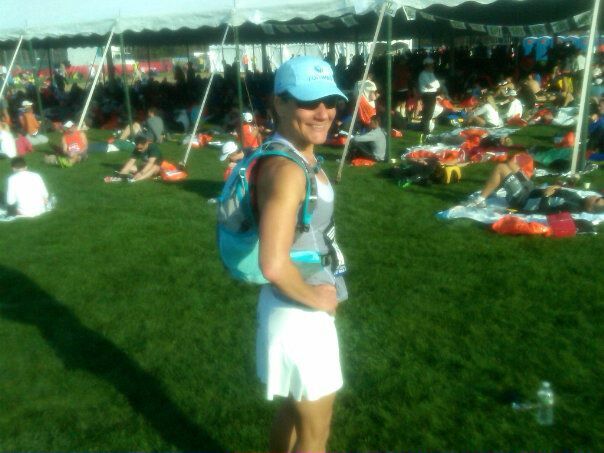 I used to live on Gatorade but cut it out about a month before the race and switched to Nuun – less sugar. I also started using Perpetuem for longer runs along with the Nuun. My plan was to start the race out eating solid foods then move to liquid and gels later in the night. My reasoning was they would be easier to digest later in the race and my body needed the energy quicker. My solid foods consist of PB&J (grape jelly. Not strawberry, black berry or jam, must be grape!) bananas, water melon, boiled potatoes, potato chips and trail mix. Later in the race I had potato soup, perpetuem and gels. I tried to drink one bottle of Nuun per hour/hour and half. I also had S-caps for extra sodium and E-caps for electrolytes. 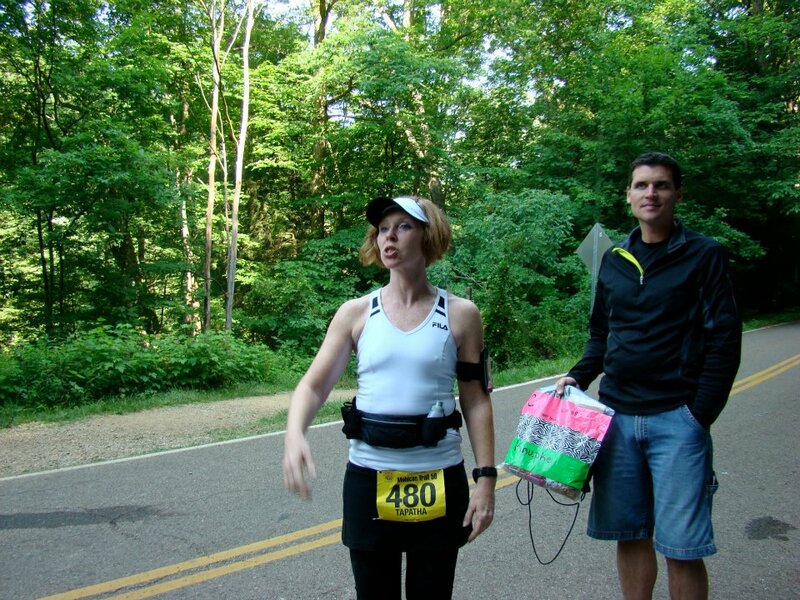 My plan was to ‘snack’ on the trail mix and fruit from the aid station until I hit my first 50K, then have my pit crew (my wife Beth) fix me a PB&J. I would come back for a banana on the next lap then boiled potatoes the 3rd lap. I would repeat that after the next 20 miles as well. I would then start with the potato soup (Potato soup is the bomb during an ultra.) perpetuem and gels from 60 on. I had baggies made up with one S-cap, one E-cap and a gel with instructions for my wife to give me one every 10 miles starting at 60. So that was the plan. I had everything ready Friday night, went out to the park to pick up my bib and set up my tent. Forecast called rain so I wanted a spot for my wife and food to stay dry during the race. Got up at 5:00 and had my traditional prerace breakfast of a Panera Cinnamon Crunch bagel. Packed up the car and headed out the door at about 5:45. Was a little nervous about the race and drove right paced my turn on Hobart road. Turned around and found my way to the parking lot. Unloaded the car and setup my supplies by the tent. Zack had tables lining the sidewalk so we grabbed one and tried to get things organized. After setting up, made my way to get my chip and say ‘hey’ to everyone. The aid station/start/finish line was the perfect setup. We would run around a large fire pit that was already burning pretty nice at 6am. It was a great place for the volunteers and crews to hang out while waiting for their runners. The course was a 1 mile loop that hit a nice little up hill about a quarter the way in, then some rolling hills before a nice gradual downhill. A few turns thru the woods and we ended back up at the fire pit for the end of the loop. The downhill was a nice relief early on in the race, but by the end of the night, it was taking its toll on my quads. I actually prefer to run up hill than down! We lined up a few minutes before 7 for the last minute race instructions then got settled in for the start. At 7 we took off across the parking lot towards the trails. A few people jumped out in front, I hung back with a group that I’ve run with at North Chagrin for the first several miles. 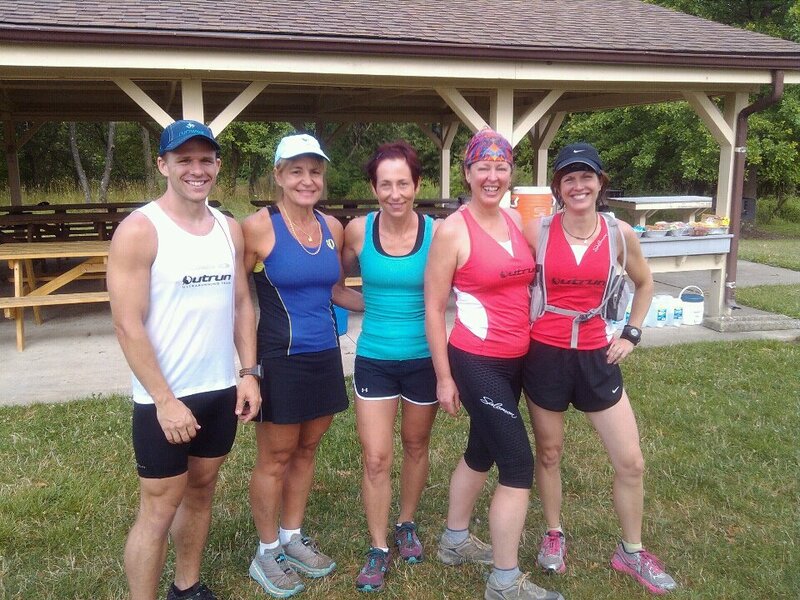 I wore my garmin to help keep me at my pace – I tend to go out too fast at all my races. 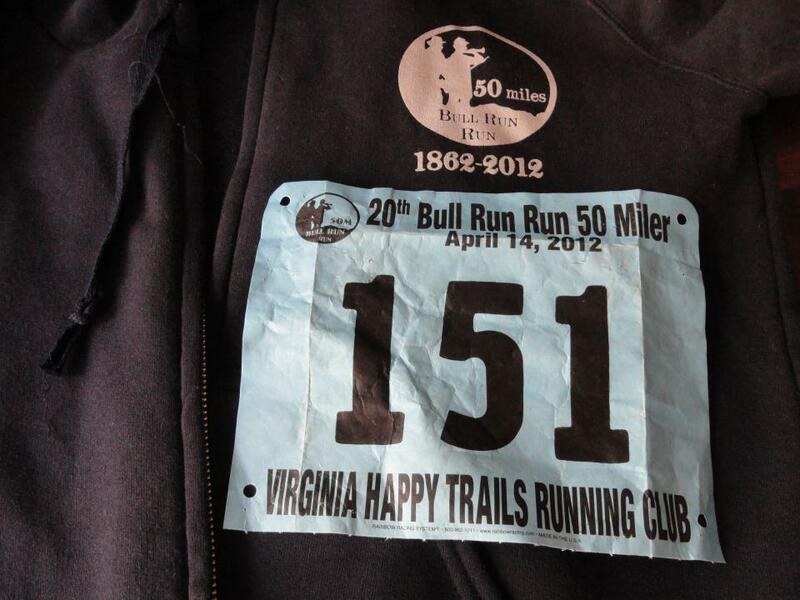 My goal was to finish the 100 miles in 24 hours with a pace of about 14 minutes per mile. I knew I could start around 10-11 and would slow later in the night. 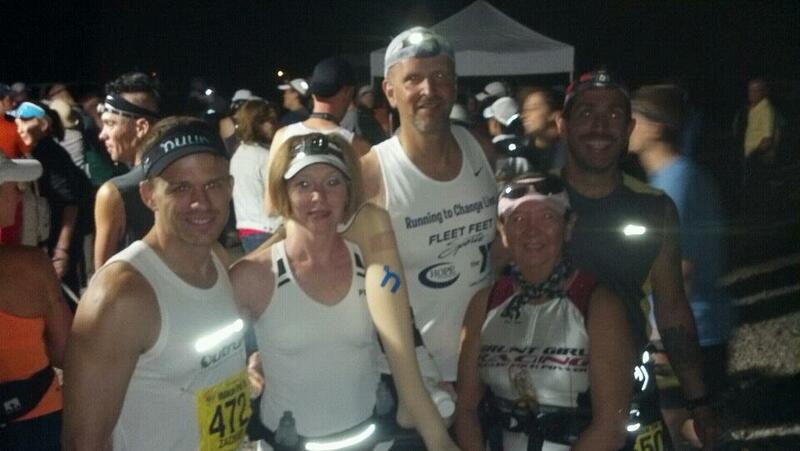 Our group of 5 or 6 kept that pace for the first 10 miles. Around mile 10, Scott McGrew caught up to us and we started talking, next thing I know I left the group and was cruising thru the trails with Scott talking about his plans to move out to Washington State with the Coast Guard, up coming races etc. I knew I picked up the pace but wasn’t paying attention to my garmin like I should have. 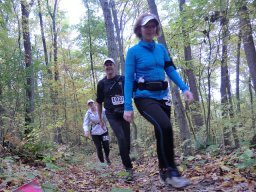 I was feeling pretty good, we were keeping up a nice steady pace and I was getting the right amount of food at the aid station. When I did check my watch I found we were hitting 8:30 – 9:00 minute miles! Remember when I mentioned that I go out to fast? Well I did it again. Scot was only planning on a 50K so I knew I had better back off or I wasn’t going to make it much passed 50 miles. With the faster pace I started to get hungry so I changed my plan a bit and had my wife make my PB&J a few miles early. Next lap I grabbed the sandwich and walked while I ate. Ever try to eat peanut butter and run? Not easy! I ran the next few laps then grabbed the banana and some water melon, walked while I ate then ran a few more then grabbed a potato. By that time I was at my 50K mark around 5:30. My 50K PR was 5:42. I just PR’d during a 100 mile race. I still felt good so I just went with it, with the idea I would see how long I could last then walk as much as I needed to recover. I could even take a nap if I needed too, wasn’t on the plan, but was an option if I bonked. About this time Brian Pulling jumped on the course so I ran with him for several miles. We were at a more ‘leisurely’ pace of 10 – 11 minute miles until mile 40. I started feeling some discomfort in my toes, so I took a pit stop to check them out. Take care of you feet and they will take care of you. No blisters so I lubed them up with some Vaseline, put the shoes back on and took off for a few more laps. My next lap Mike Nicholson asked if he could run a few with me. Dumb question, I love running with Mike. He is so light on his feet and is a sub 3:00 marathoner. He wasn’t planning on running and was in his jeans, but he ran two laps with me. We weren’t tearing up the course, but I was at mile 40 something and he did pretty good to push me but not kill me. We talked about his Boston race in 80+ degrees. I was glad it was only in the 50’s for this race. I ran a few more laps then started hitting the aid station more frequently for Nuun and watermelon or potato soup. I hit mile 50 at 9 hours and 30 minutes. Two hours faster than I was planning! Around this time Jody Herzog from Fleet Feet, one of the sponsors of the race joined me for several miles. We were both wearing our Outrun shirts with the Fleet Feet logo on the back, so it was good advertising for is store. At this time I was feeling my 2nd wind and was passing a number of people. He kept me focused and made sure I was eating/drinking on schedule as we hit several more miles. I was close to mile 70 by this time and was starting to feel it. I started breaking the run down into smaller sections and threw some walk breaks in while I ate. Walk to the cones, run to the hill, walk up the hill, run like hell to the aid station. Repeat. I would like to report on miles 70 to 90, but really don’t remember much LOL. I do know I hit mile 84 at midnight. At that pace I would hit my 100 miles by 2:30-3:00am. Soon after I hit 85 miles I started feeling a pain in my right foot/shin. Haven’t had shin splints in years and this was the start of a nasty one. Stopped a few times to try and massage it out but not much helped. It hurt when I walked but actually hurt less when I ran, so I picked up the pace again. It wasn’t a fast pace, but I was moving. When I hit 91 with single digits left, I got a burst of energy and took off for a few laps. But then I realized that I wasn’t moving as fast I as thought and at that pace I still had well over an hour to go! The last few miles were more combination of walking to the cones then running. I ended up finishing at 3:08 am for a time of 20 hours and 8 minutes. Almost 4 hours faster than I planned. Some random notes on the race. Not sure where The Leg came from, but a manikin leg with an O24 sticker made its way on to the course, first appearing on a bench. Runners took turns moving The Leg around the course and posing it in trees, under drainage ditches etc. 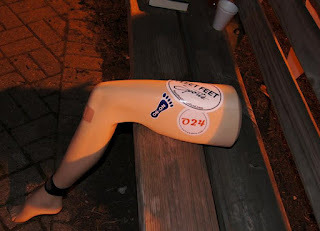 After some time, more stickers appeared on The Leg and then a timing chip. At this point The Leg was carried across the starting line by runners to see how many miles she could get in. I carried The Leg across the finish line on mile 100! I think this is the start of an Outrun tradition and The Leg will see many more races and stickers. Can’t thank Zack and the volunteers enough, every thing was great. My wife is my biggest supporter and the best pit crew I could ask for. She had all my gear ready and made sure I stuck to my nutrition plan. I was definitely tired towards the end of the race, but I didn’t “bonk” because of her. And I didn’t throw any potatoes at her. LOL Inside joke about Burning River, go for a run with me some time and I’ll tell you about it. One last note, the only thing that could have made this race better would have been coyotes. LOL Zack promised coyotes but I didn’t see any. Where do we begin with this event? I will write a complete report soon, but I think we can say that it was a success.